Get ideas for your wedding flowers by month by reading our monthly flower blogs as a guide to what is in season when, during the year. Clearly, it is a really important decision to choose the best wedding flowers to suit you and your dress, but sometimes it is difficult to visualise months ahead. By looking at a selection from our favourite weddings, from our Blog, you will be able to get a feel for what flowers are in season for your wedding date. Over a full year, there are so many gorgeous flowers in the bouquets and floral arrangements that we have created for brides for you to take a look at. They range from bright Spring jewels to gentle scented blooms. Some months are more of a challenge than others for certain flowers. Spring and winter are the obvious tricky seasons - but with the right advice, you can turn this into an advantage and have some of the most beautiful (if date specific) wedding flowers on your big day. Only in the early months of the year is it possible to have gorgeous tulips and spring bulbs, for example. There are also some gorgeous blossoms such as cherry and prunus varieties that are only around for a few weeks each year. Choosing these flowers will mean that they will always remind you of your day, in the years to come. Roses are the perennial favourites, of course, and they are available every month. Catherine has such a wide knowledge of unusual varieties of roses that she is able to match their colours to any theme. Later in the year, peonies come into prominence and there cannot be a more gorgeous, blousy flower than them. Mixed with roses, they are able to provide a richly sumptuous bouquet or display. Christmas and winter weddings can be richly coloured with deep reds - roses and berries - or frosty and white with Christmas roses (Hellebores) real white roses and beautiful white berries. There is an opportunity at this time of year to add frosted willow or seed pods to enhance the specialness of the occasion - and there are some beautiful deep winter berries to act as highlights to set off the main colour scheme. Looking at wedding flowers by month always gives lots of options. As always, the choice is yours, but Rose and Grace are able to help to make your wedding flowers absolutely memorable at any time of the year. Please take a browse amongst the flowers featured in our blog posts and then give us a call at Rose and Grace where we will be happy to discuss your wedding ideas. 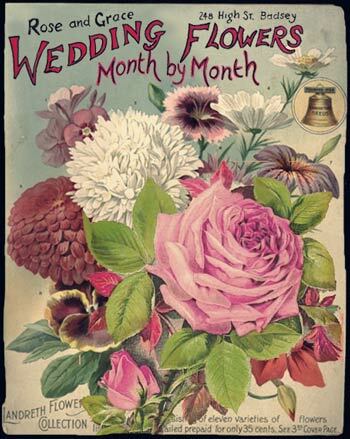 By clicking on the images for any of the months illustrated at the start of this page, you can visit the flower month pages from our blog. We hope that it will give you some ideas on your own wedding flowers. If you would like to know more, please ring Catherine now on 01386 832120 or mobile 07771 776 173 for a free consultation. Follow the links above for January wedding flowers, February wedding flowers, March wedding flowers, April wedding flowers, May wedding flowers, June wedding flowers, July wedding flowers, August wedding flowers, September wedding flowers, October wedding flowers, November wedding flowers and December wedding flowers.